Jeanne Lanvin perfume is a modern fragrance, with a poetic and elegant blend of notes. Jeanne Lanvin is a sweet and tender pale violet coloured fragrance that brings a new soft sensuality to the Lanvin perfume collection. Jeanne Lanvin perfume is a very feminine, modern and young fragrance with a delicious and timeless fruity heart and sensual, warm and sweet notes. Jeanne Lanvin perfume begins with Cedrat, Wild Blackberry and Pear Nectar, over White Freesia, Raspberry and Peony and a rich base of Ambergris, Sandalwood and Musk. 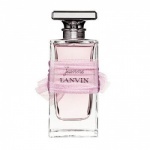 Jeanne Lanvin perfume is a very feminine, modern and young fragrance with a delicious and timeless fruity heart and sensual, warm and sweet notes.